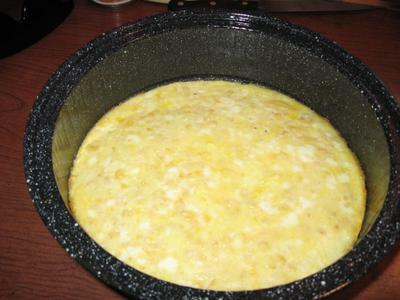 I looked up several corn pudding recipes online and most used canned corn, but with all of the good fresh corn available, I didn't want to do that. I used fresh corn, and didn't add any "extras" no bacon, no cheese, no onion, no jalapeño. I just wanted the corn flavor to shine through. You can add those ingredients if you choose. lots of butter- I used about 3 Tbsp. Stand corn up in the center tube of a Bundt pan, or Angel Food cake pan. Cut kernels off the cob with a serrated knife, do not cut too deeply. The Bundt pan will catch almost all of the corn kernels and the corn milk. Hold cobs over another bowl, and scrape them with the back of a butter knife. Put the scrapings and milk in a clean cotton dishtowel and squeeze all of the corn milk into a bowl. Break the cobs in half, put in kettle with the milk, butter and sugar. Bring the milk to a simmer, turn off the heat and steep the cobs in the warm milk for 15 minutes, then put the flour in a mug, and add some of the milk and mix it together until it's smooth. Remove the cobs from the warm milk and add the flour mixture, the corn milk, and the beaten eggs and mix everything together. Put in baking dish sprayed with Pam. Put a lid on it. At 300º, this will take between 1-1/2 to 2 hours. Lower heat is better for a custard as it will prevent it from curdling and separating. I will have to show this to my wife, she likes corn based dishes like this, it is common to make such in Chile where she comes from.